When you lose someone you love, the loss becomes part of you. As time passes the loss changes shape, weight, texture, but you carry it everywhere. It’s experience that changes you, wisdom to share in measured doses, depending on how willing another is to receive. 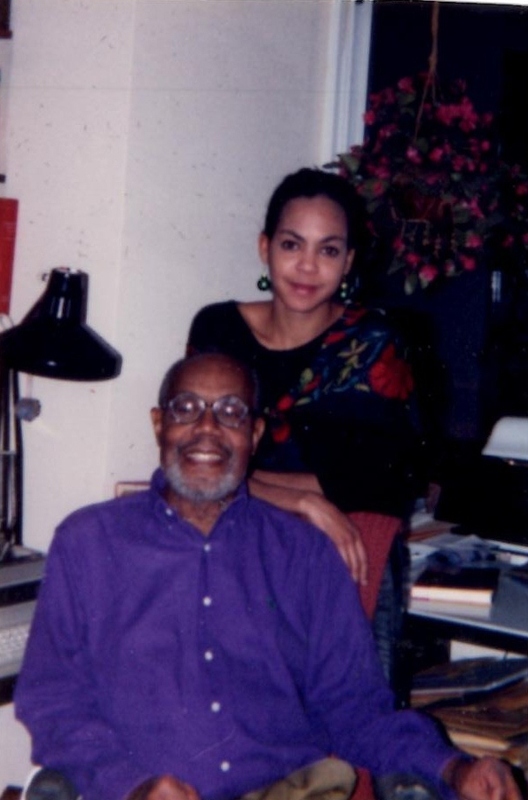 My father died of cancer seventeen years ago today: February 13th, 1995, the day before Valentine’s Day. We sat shiva for just three days before we felt him urging us to get back out into the world and live—on his behalf, on our own. I remember walking outside on February 17th and thinking what a lonely place it was without Mel Williamson. Lonelier still for those who’d never known him. And then something happened—I don’t remember what—I saw some interaction between strangers on the street: something Dad would have made a comment about or laughed at, and I remember smiling. A private smile, between me and Dad’s memory. Since the day he’d died, I’d been getting back memories of the real him—not the fragile man who’d been in his bed for the past year and a half—but the hearty, brilliant, loving and funny guy my Dad was before. But that day, walking, thinking of him, imagining his smile, hearing his rich bass laugh in my head, it was suddenly clear: I’d be okay. In the beginning, I cried every day—many times a day—missing him, longing for him, saying angrily, he should still be here! But mindful of his pain, I’d add: not like that. The first year was hardest; there was still so much I wanted to ask him and tell him. The next four years were the next hardest. With every milestone, including my wedding in 1999, I’d think it: you should be here, Dad. Once I met a woman who lost her father before I lost mine. She told me: the first ten years are the worst. Then it gets easier. And it’s true. Sometime after the tenth anniversary of my father’s death, I stopped feeling angry that he was missing so much of my life—and by then my children were born. I actually started enjoying the wistful moments: what would Dad have thought of this? What would he have said to that? My children enjoy hearing about him; I enjoy seeing traces of him in them. It is easier now. As I gain distance from my father’s death, I want to share the balm of time that’s made my loss easier to bear. But when I meet others who have recently lost parents, or who are losing them, I hold myself back from saying things like “you’ll get through it,” or “it’s hard, but it will be okay.” Everyone’s loss is their own, as is their pace of recovery. I can’t tell you how it’s going to turn out for you and your loss. I can only say, you’re not alone, and if you need to talk, I’ve been someplace similar. In June 2010, I published Soul Food Shiva, a more detailed essay about losing my father to cancer, in the Defenders Online. You can read it by clicking here. This entry was posted in Cultural Context, General Identity, Loss and tagged Cancer, death, Loss, Love, memories, time. Bookmark the permalink. My Mum died of cancer on the 21st of April 2002, it will soon be 10 years. I don’t know if i can say that the pain will start to ease, because i don’t even know if it started, and how and when. I still don’t know how i feel about her loss. Mum is the most beautiful person. She was 55. I didn’t cry, not even once. I was peaceful and calm on the outside, but angry at her for abandoning me. Now i still can’t cry, but my anger is replaced by guilt. I love my Mum, but I don’t know if i said it enough. Nikky, you deserve to forgive yourself for your anger. You have every right to all your feelings. And tears will come, if they do, on your schedule, no one else’s. I’ll be thinking of you that day. This is beautiful, Lisa! He sounds like a great hand and I say that in present tense. Relationships and meaning don’t end in death, but last forever! What a beautiful post Lisa. I love the photo of you and your father. He looks like a kind man. Thank you for sharing your memory of him with us. Thanks Louise! I love that picture too. Thinking of everyone who has lost a Valentine, a long term spouse or partner (and I have several family friends who have, this very year, said goodbye to the loves of their lives, partners for half a century and more). I’m reposting this, dedicating it to my mother, who misses Dad in her way as I do in mine. With love. That was touching and inspiring, Lisa. I could feel your closeness and relate back to my great-grandmother, whom I think about a lot. It does get easier and we are so fortunate these good folk graced our lives with grace. He must have inspired your life, growing years. We are losing my father, he has prostate cancer @84 yrs. And I have already lost a sister to suicide. She was 1 yr. younger than I. Just a few yrs. ago. There are advantages to being part of a large family (I am eldest of 6 children), it can provide a large cushion of psychological support and provides diversity of exposures and tolerances to different personalities up close for a long time. But then a person’s sadness multiplies if one lives long. The only thing is have some more friends along the way in life..which becomes more complex/harder as one ages. While some people have dreams of travelling all over the place as part of their basket of “to-dos”, I’d rather collect such experiences by happenstance. It is our loved ones who we may to spend the most time with. What a beautiful tribute to your father, Lisa. I lost both of my parents nearly 20 years ago. You’re right it does get better. But, my daughter was barely three when they died, and I hated the idea of her missing out on them and vice versa. I figured my son, who was nearly 10 had memories of them but she would never. So, I started pulling out all my photos of them, and buying pretty frames for the photos and displaying them all over my house. In a way, they were always there. But now, my children know what they looked like and it’s imprinted on them. And they have the stories I’ve shared. At least, that’s something.